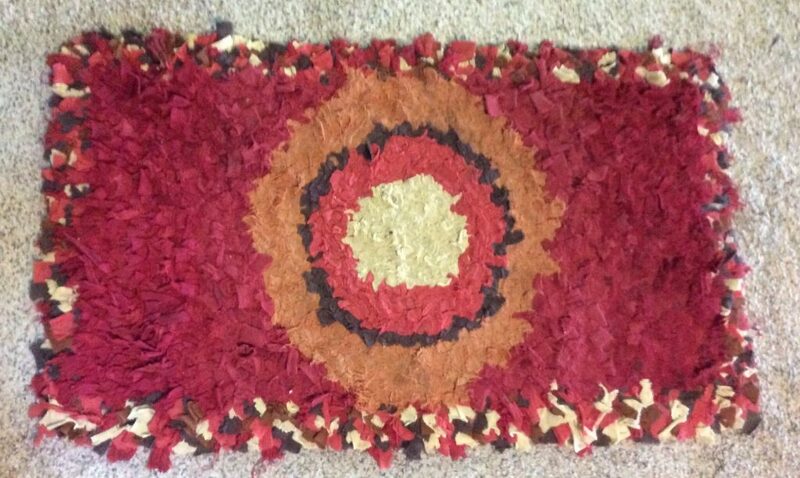 This is the first proddy rug I ever made. I was living in the northwest of England, and saw a notice for a one-day class in making rag rugs in the parish newsletter, signed up, went, and had a wonderful time, and met some very nice women in the nearby market town of Kirkby Lonsdale in the process. I’ve never liked the design very much – concentric circles are just not that interesting, but have always been fond of it anyhow, and it has laid in front of our stove for years. It’s a bit grimy and flattened from so many feet finding cushion and comfort from standing on it for hours and hours while cooking. Making a proddy rug takes a lot of wool. How much? Way more than you anticipate. For me, this is good – my wool is overflowing it’s shelves. I still want to look through again to add more rust-colored wool. And maybe a piece or two of gray. 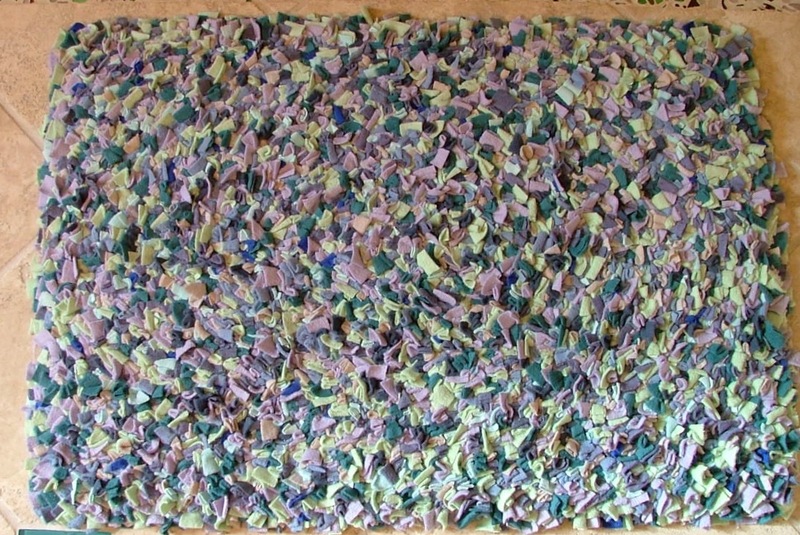 English rugmakers also call confetti rugs “mizzy-mazzy” rugs – don’t even bother to ask me why, but it is a great name, isn’t it? The secret of having enough wool in different colors for a confetti rug is to use a lot of different blues, for example, so that as you run out of one blue plaid or solid, you can just add another one in. 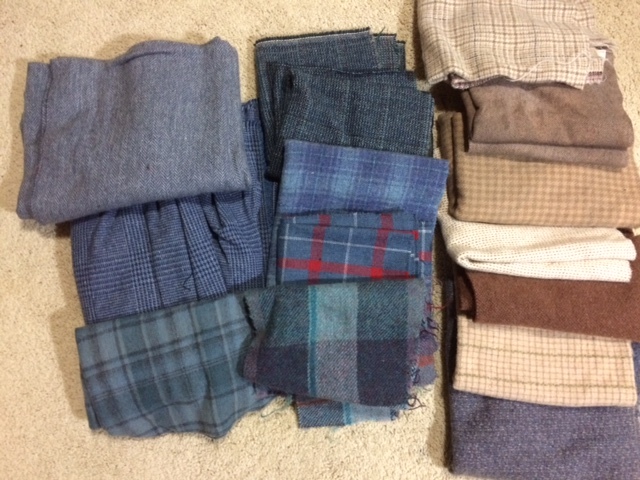 Some people cut a lot of wool and divide up each color into four piles or bags, so that most of the colors are evenly distributed for each quarter of the rug. And proddy means a lot of cutting. I will start now, first cutting long 1″-wide strips, and then taking two or three long strips and cutting them into small 2 1/2″ or 3″ pieces. A good task while watching a movie or four… I can usually cut two or three thicknesses of wool at once into long strips, which helps. At least for proddy, your cutting does not have to be all that precise. If one long strip is slightly wider at one point, and thinner at another, it really does not matter, it will still be fine. And during stressful days, “It will still be fine” sounds like just the kind of feeling I need. Love the counter and the rug!! Great shade of blue..
hope everyoneis feeling fine now. 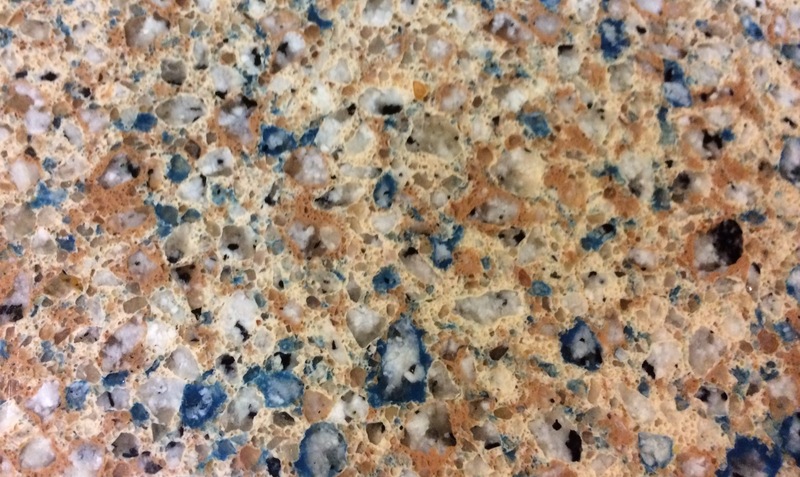 Like your new counters and colors for your proddy. Sorry, just saw your post. I’m always behind on my emails. I blame FaceBook. Hope this week is going better – much better. Nice countertop and always fun to start a new rug. Hope husband and dog are going OK. And hope the caretaker of all she takes care of is also OK. Love.